Nearly one in four local businesses plan to cut back on newspaper advertising this year, according to a poll being released today. And there is no mystery about what they are doing with the money. At the same time those businesses trim newspaper expenditures, the survey found, many of them plan to aggressively ramp up spending on a broad array of web, social and mobile media. Insights into the ad plans of local merchants were gained in an ambitious poll of more than 2,700 small and medium businesses in 40 states conducted over the summer by ITZBelden in conjunction with the American Press Institute. The findings are to be reported at a meeting today at the API in Reston, VA.
Ominously, the poll found that 23.0% of the advertisers who represent the single most important revenue source for most publishers intend to cut their newspaper ad budgets. By contrast, only 5.3% of the businesses said they would reduce spending on advertising in competing digital media. Even as businesses pare back their print budgets, 23.2% of companies plan to increase their digital ad spend by 11% to 30%, the survey found. By contrast, only 9.9% of advertisers intend to boost their print expenditures by 11% to 30%. The balance of the advertisers plan to keep expenditures in both categories about the same this year as they did in 2009. The poll found that advertisers are spending their digital marketing dollars widely. Fully 81.8% of respondents have a website, 45.1% maintain a Facebook or MySpace page, 22.5% engage in online couponing, 13% use Craig’s List and 10% use Yelp and similar user-review sites. Only 3.4% said they planned to buy mobile ads. When advertisers were asked where they planned to target their marketing dollars in 2010, the average allocation for newspapers was 23%. 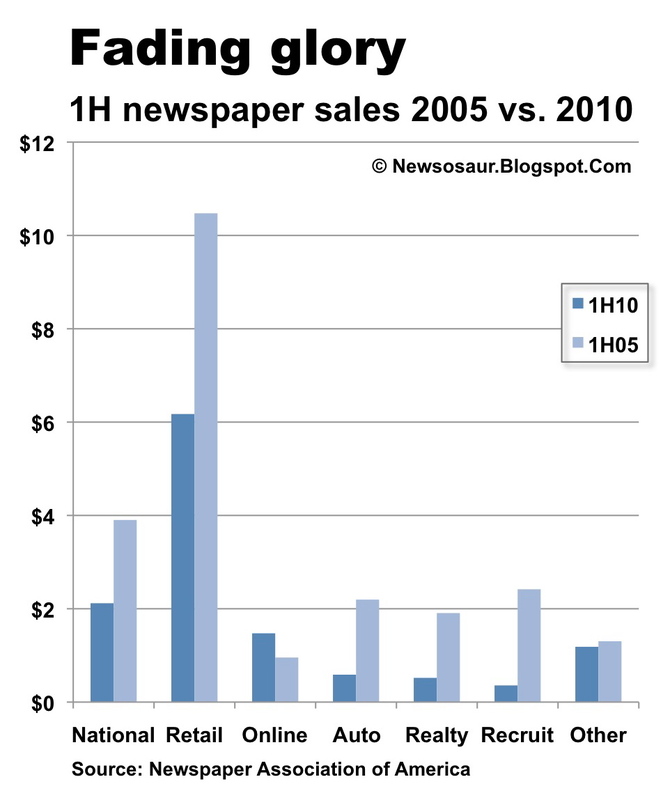 While this percentage would leave newspapers as the dominant local medium in most places, it is well below the 35%-plus market share that publishers enjoyed in the pre-Internet era. Assuming businesses act on the intentions stated in the poll, they will put an average of 13% of their ad dollars this year into digital media. 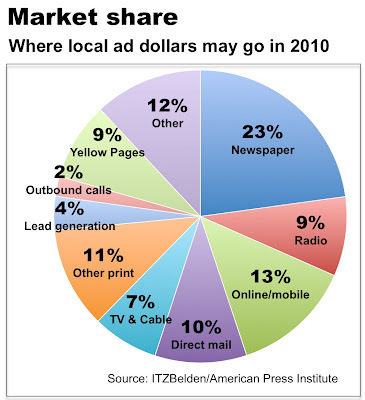 As illustrated below, this would give digital media the second-largest share of the dollars spent on advertising in a typical market, surpassing such traditional rivals as direct mail, television and the Yellow Pages. The aggressive shift of spending to digital media identified in the poll suggests that local retail advertising may come under even more pressure than publishers have experienced to date. Although local retail sales in the first six months of this year were 41% lower than they were in the comparable period in 2005, this category – which represents almost exactly half the industry’s ad base – has been least affected by the collapse in newspaper advertising caused by the growing preference among consumers for digitally delivered news. As reported last week by the Pew Center for People & the Press, only 31% of Americans today get their news from the newspaper, as compared to 56% in 1991. This is exceeded by the 34% of respondents who said they get their news online and the stunning 44% of consumers who said they get their news on a mobile device. The worst of the $23-ish billion dive in newspaper advertising since 2005 has come as the result of a decline in classified advertising. Between the end of June in 2005 and the end of June of this year, recruitment advertising has swooned 85.2%, automotive advertising has plunged 73.3% and real estate advertising has slid 72.8%. Full details previously were reported here. What does it all mean? 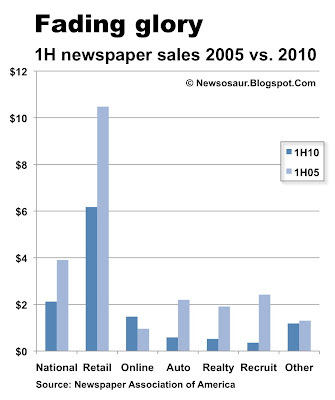 Simply this: Newspapers can’t afford to lose the faith – and the patronage – of retail advertisers. One potentially powerful way for newspapers to reassert their relevance to advertisers is by establishing themselves as experts in the growing array of digital media that merchants are hoping to use to lure customers to their businesses. Encouragingly, 71% of respondents to the ITZBelden/API survey said they are confident that newspaper ad reps could help them make the most of their marketing dollars on the web, social networks and in mobile media. “I was blown away” by the faith they have in newspapers “to guide them though the bewildering array of new media,” said Greg Harmon, who conducted the poll. This column originally was published in Editor & Publisher Magazine and is being reprinted with permission. To subscribe to the magazine so you can see the full array of industry coverage when it first appears in print, click here. “What trees do they plant?” the original Major Richard J. Daley once demanded angrily of his critics in the Chicago press. He had a point. Anyone can find fault with City Hall, but it’s another thing to run a complex metropolis in a challenging time of change. That didn’t stop us from criticizing the mayor, of course. But he had a point. Because every media business depends on attracting an audience and selling it for money, newspapers honestly and objectively must understand who their readers are – and, even more significantly, who their readers are not. Newspapers simply cannot rest on the residual power of their brands or milk the waning reach in their markets. They have to find fresh ways to delight existing print and digital customers at the same time they identify strategies to attract former readers and non-readers. The one lesson we have learned in the age of media fragmentation is that one-size-fits-all media won’t please all the people all the time. Newspapers must develop cost-effective niche media to serve carefully targeted audiences coveted by advertisers. While the profits of many of the niche products may not equal the historic margins of the flagship brands, a well-conceived portfolio will achieve economies of scale and assure a healthy and defensible future for the business. For an expanding number of people of all ages, media consumption increasingly is active and not passive. Newspapers have to abandon traditional, voice-of-God journalism in favor of an ongoing dialogue with their readers. This includes embracing reader comments, aggregating content from disparate sources, soliciting articles from multiple vantage points and sometimes even serving as organizers of community forums and debates. Instead of putting walls around their content, publishers should encourage remixes, mash-ups and other user customization. Remember: Remixing is the sincerest form of engagement. Modern consumers view the digital media as a living, breathing community in which they have a rightful voice. Publishers hoping to have an ongoing relationship with those consumers must incorporate social capabilities liberally into their products. That means digital applications must include sharing, commenting and reviewing capabilities to cross-pollinate content and audiences among sites. This will pay dividends in increased traffic, as well as valuable in-bound links to boost rankings on Google and the other search engines. YouTube, Facebook, Twitter, Flickr, Digg and other social media should be viewed as partners, not competitors. Within reason, news sites need to include such game-like capabilities as multi-user play and leader boards to stimulate ongoing interest. Like it or not, we live in an age of attitude throughout the media, from Rush Limbaugh to Jon Stewart and everyone in between. Newspapers look like fuddy-duddies when they steadfastly cleave to a studied grayness while the rest of the highly competitive media landscape is filled with heat and light (though the heat and light, sad to say, in some cases is not the same as substantive illumination). To hold their own amid the hubbub, newspapers have to project personality into their writing, graphic packaging and marketing. Newspapers need to work like there is no tomorrow to solidify relationships with their readers and advertisers. Otherwise, there might be no tomorrow. For readers, newspapers need to emphasize authoritative, incisive, thorough and compassionate reporting on local issues – and a relentless focus on the quality of life in the community. To woo advertisers, the traditional themes still ring true: an engaged audience, a trusted environment, efficient market coverage, reliable delivery and superior customer service. With the economy likely to remain in the doldrums for the foreseeable future, newspapers ought to be seeking to deliver a discernible return on investment for readers by helping them make or save money –ideally, doing both at the same time. This can take the form of shopping coverage, consumer advocacy, career advice and personal-finance reporting. Quality coverage of small-business issues not only will please a large and engaged cadre of influential readers, but also could turn a fair number of small business owners into advertisers. Don’t forget that 28% of all small business owners in the United States are women, while a combined 17% of small enterprises are owned by African-Americans, Asians and Hispanics. To succeed, newspapers need to cultivate internal cultures of openness, customer service and innovation – but disciplined innovation based on the following sequence: (1) identify likely prospective audiences and advertisers, (2) develop a comprehensive go-to-market plan, (3) construct a detailed operating budget and (4) build and launch products only after the first three steps suggest the project has a significant chance of success. When you go for it, go for it. Don’t stint on the fertilizer – a proper level of investment – that makes every business grow. Newspaper and TV newsroom mergers could become the next big thing as profit-pressed publishers and broadcasters seek to cut costs and strengthen their digital presence. But will hybrid newsrooms live up the promises of producing better journalism? The performance of the longest-running major newsroom merger – the combination 10 years ago of the Tampa Tribune and WFLA – is far from encouraging. The latest cross-media merger was announced yesterday in Salt Lake City, where the Deseret News said it planned to shed 43% of its staff and move into the newsroom of the KSL-TV, an NBC affiliate that also operates AM and FM news radio stations. All four properties are owned by Deseret Media Companies, which in turn is owned by The Church of Jesus Christ of the Latter-day Saints. The draconian effort to save some semblance of the News comes in spite of the fact that it long has participated in another supposedly advantageous partnership. Since 1952, the newspaper has been in a joint operating agreement with the Salt Lake Tribune, where the jointly owned Newspaper Agency Co. handles ad sales, production and delivery for both properties. MediaNews Group owns the Tribune and the two publishers split the profits from an operation that is more efficient than would be possible if each paper maintained its own sales and production infrastructure. But times have been tough for even JOAs, as witness the shutdowns last year of the Rocky Mountain News, Seattle Post-Intelligencer and Tucson Citizen. You cut duplicative coverage, headcount and expenses by sending a single reporter to a press conference or a solo cameraperson to a car wreck. You enrich your web and mobile offerings with better video from the TV operation and deeper content from the print side. With any luck, seamless cross-media promotion will build audience in print, on the air, on the web and on the many proliferating mobile platforms. The combined reach and efficiency should be a major selling point with advertisers, too. The cost-savings are so appealing to broadcasters that no less than 224 television stations in the country today get their news from another station, according to Bob Papper, the chairman of journalism and media studies at Hofstra University, who conducts an annual newsroom census for the Radio and Television News Directors Association. Although few newspaper publishers to date actually have acted to pool resources with a local TV station, it happened last year in Hartford and a decade ago in Tampa. If newspaper revenues don’t begin to stabilize soon, a growing number of publishers may begin to take this idea as seriously as hundreds of broadcasters already have. While hybrid newsrooms undoubtedly save money on everything from reporters to real estate, the journalistic improvements promised by Media General a decade ago are not evident at the combined news operation of the Tampa Tribune and WFLA, an NBC affiliate. As advertised when the Florida newsrooms merged, print reporters indeed learned to work on camera and TV personalities began to contribute to the newspaper. But those efforts, which are presented today for the world to behold at TBO.Com, are, in a word, underwhelming. Instead of combining the assets of the newspaper and TV station in a single, dynamic website, TBO.Com is primarily a compendium of cheesy police news and out-of-market AP stories. If you follow the breadcrumbs on the website to the separate pages for the TV station and newspaper, you get nothing more than the sort of shovelware that populates the website of a mediocre broadcaster or publisher in a mid-sized market. At this writing, the lead story and video on the TV site is a cheapie about a man who killed his cousin in a dispute over a necklace. If stories from today’s paper are on the web, they were impossible to find. Neither the newspaper, the TV station nor the website has an iPhone app, although the competing ABC and Fox affiliates in the market do. The weak execution is understandable in light of the steep cuts Media General has made in staffing at the Tampa properties since they first were combined. Half of the 1,326 people working at the newspaper, TV station and website were cut in 2008 and subsequent layoffs and reorganizations have claimed more positions since then. The gruel at this newsroom of the future is way too thin to woo discerning readers and advertisers.